Mission Crossroads is a three-time-a-year magazine focused on worldwide work of the PC(USA). It offers news and feature stories about mission personnel, international partners and grassroots Presbyterians involved in God's mission in the world. 18 Spring 2017 be slightly different. I wasn't unselected as I feared and had the privilege of being in the photo, but my fears were not baseless. We had made none of the choices. It was outside of our control in a culture not our own. My roommates did not victimize me with their whiteness and had stood by my side through it all. ey had a chance to experience what it was like to be exoticized—an experience that no doubt opened their eyes to being "othered." However, what they did not experience was a shift in power dynamics. ey still carried their white privilege with them, getting preferential treatment for the color of their skin. is was a common theme throughout the year, and one common to most international YAVs. In a predominately white program, my experience seems like the exception, but it is not. e greater Asian-American community has echoed many of my experiences of being abroad. I am not T he moment the teacher said they wanted to take pictures of the Americans, I got nervous. ere was a Korean language contest that we weren't part of, but they wanted our pictures—or rather, I thought, my white housemates' pictures. is type of near unabashed racial selection isn't uncommon in Asia, and for universities, I knew that looking international and showcasing their diversity was good for their reputations. e only problem was that in Korea my Chinese face didn't look diverse. My roommate, Emily, assured me she wouldn't let them leave me out. When the day came for the photo shoot, after an introduction in the auditorium, my housemates and I lined up with people of various un-Korean looking ethnicities, which included an unusual amount of white people for the area. e Chinese students, who were a majority of our class, along with a few students of other Asian nationalities, were not invited to participate in these photos. I stood nervously, making sure I knew where my housemates were in case I got left behind, waiting for the other shoe to drop and for a teacher to call me out of line. But no one did. We all went out to a grassy field between the university buildings, where they handed out signs spelling out a sentence in Korean. One section held nine squares that created a photo of King Sejong, the ruler who created the Korean writing system. I was surprised they hadn't pulled me out yet, and thought perhaps it was just too awkward to call out one person. Perhaps I was just hyper- aware of race at this point, but I noticed that a dark-skinned Filipino man was asked to hold the very center sign which covered his face completely. It hurt to watch. After finally getting the shot they wanted, the photographers asked my roommates, Linda and Emily, to be in another photo shoot. ey, along with a few other female students, posed with clipboards for a Korean language contest promo, despite not being part of the contest. 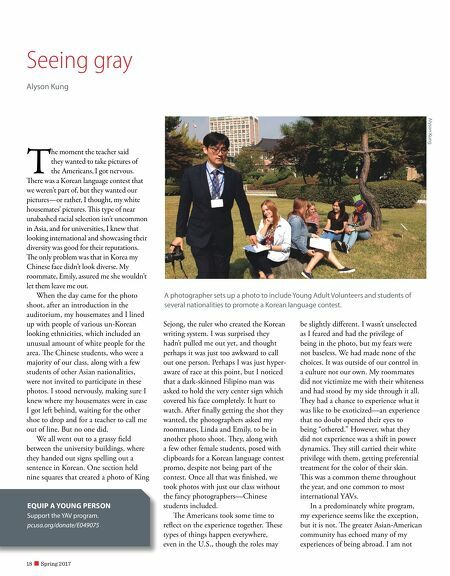 Once all that was finished, we took photos with just our class without the fancy photographers—Chinese students included. e Americans took some time to reflect on the experience together. 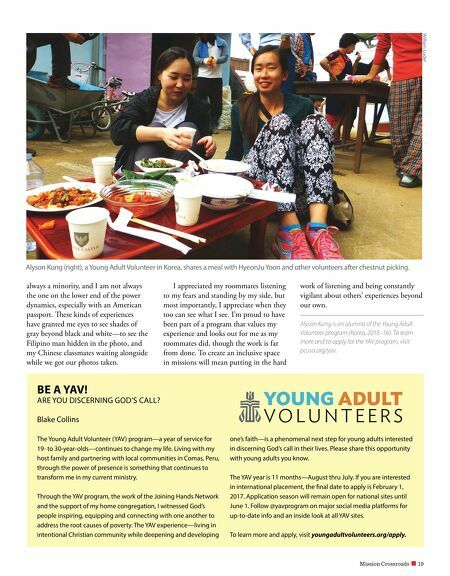 ese types of things happen everywhere, even in the U.S., though the roles may Seeing gray Alyson Kung EQUIP A YOUNG PERSON Support the YAV program. pcusa.org/donate/E049075 Alyson Kung A photographer sets up a photo to include Young Adult Volunteers and students of several nationalities to promote a Korean language contest.